This flashy hand and a half sword is just the thing for anyone that's looking to make an impression. 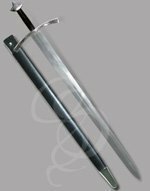 The double-ring guards and double-style grip give this sword crazy style points. The guards are made from steel double-rings, which is absolutely unheard of: to think that someone equipped a sword with cup-holders. How much does that rule? You can fight, take a moment to sip your coke, then put the can back in the ring and continue to ... uh ... my editor is reading over my shoulder and told me that they're not cup-holders and to, "knock, it off." Okay, so they're not cup-holders. They're actually to protect your hand. But why don't we make guards that can protect your hand AND be cup holders? We'd corner the market on them! Let's get a patent on them, stat! The sword is about 47 inches in total length. A little short for a standard hand and a half sword, but then again, Luke Skywalker was a little short to be a stormtrooper, wasn't he? (I have no idea what that means. Just go with it). 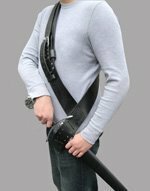 The shorter length actually helps with the balance of the sword. It weighs in at about 3.5lbs, so it's no daisy, but the point of balance is set nicely at about 5 inches from the guards. One of the most interesting parts of this sword is the split-grip. The bottom half of the grip is leather and the top part is a braided wire wrap. This not only gives the sword an exotic look, but also provides great grip no matter what you're wearing on your hands (okay, if you've got those lacy Madonna half-gloves on, it's probably not going to work out well. For a number of reasons). The blade is 37 inches of high-carbon steel. Width is about 1 and 7/8 inches at the widest part of the ricasso. This is a stylish, exotic looking hand and a half sword that can be used one-handed or two-handed. Material: Blade: High carbon steel. Grip: Wood with half leather and half braided-wire wrap. Overall, I am very impressed with the sword. My biggest, and really only complaints, are that the guard is NOT steel (I believe it's tin or pewter), I could tell because of it's tarnish, and the fact that it was not magnetic. The leather on both the handle and sheath, are IMITATION LEATHER. 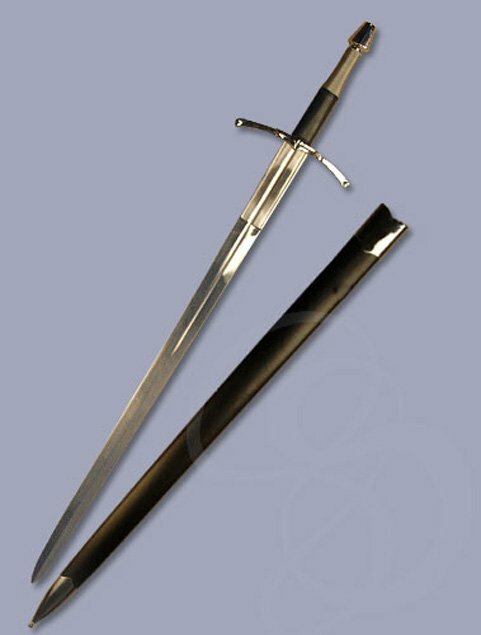 The sword does in fact have a full Tang, and a threaded pommel, which I am very satisfied with.